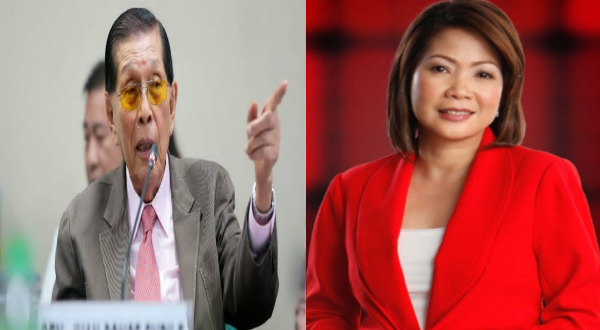 In his interview last year with journalist Luchi Cruz-Valdez, former senator Juan Ponce Enrile, got into an almost heated debate with the journalist, and showed a stance defending President Rodrigo Duterte as well the Marcoses. Enrile tackled issues such as late strongman Ferdinand Marcos' declaration of martial law, Duterte's then statement of considering to declare martial law, and the Marcos heirs making their way back to power in the country. Asked about his opinion on the Marcoses going back to power, Enrile said that it is not for anyone to say who should be in power, it is the function of the people and the society. "If the people want them to be in power, who are we to say no?" Valdez asked Enrile regarding his ambush asking if it was in fact fake. The said incident was known to have sparked martial law. "You claimed that the ambush was staged, but later when you launched your book, you denied that the ambush was fake." To this Enrile said, "I did not deny, I always said that it was staged, but it wasn't staged by me which was the implication of people in reading Bonner." Enrile said that he had no idea that an ambush would occur. "But at that time Sir did you know that Marcos' hand was behind it?" "Who said that it was Marcos who did it? I never said that." Asked about his opinion on President Rodrigo Duterte claiming that he will declare martial law on Mindanao nine months ago, Enrile said that it was the President's power to do so. "Ayaw ninyo gamitin ng Presidente ang kapangyarihan na binigay ninyo sa kanya." Valdez then said that the public in general get scared at the mention of martial law. Enrile then questioned who the embodiment of the people was. "Did you know the temper of the people?" He said that people feel more secure, because the country has a president who is not forcing the law. "Martial Law is not self-executing. It is a power that may or may not be exercised by the President. He may be forced by national exigencies to exercise the powers, not to protect himself or his position, but to protect you and the public so that the country will not be damaged and the people could not be injured." Davila said that the power is subject to abuse, but Enrile said that any power is subject to abuse, with no exception. "Kaya nga sir, sa ilalim ni pr duterte sa tingin nyo po ba sya ay magiging responsable sa paggamit ng martial law?" "You trust him, you voted for him to become president"
He said no one else can exercise that power but the president who was selected by the people. He emphasized that Duterte is the leader, and not a follower. Valdez asked if Enrile was for the new safeguards in the new Constitution on martial law, and Enrile said that he was against it. He claimed that even in Iran, Russia and America there is martial law. Enrile said that the safeguards weakened the state. He said that should come emergencies such as forces that cause disorder and need be quelled, martial law is necessary. He said that in such times, bail and the writ of habeas corpus is not necessary, because the armed forces is necessary. Valdez said that this shows an authoritarian rule, but Enrile said that such is not necessarily an authoritarian power, but the power of the state in any society for survival. Valdez said that the history we are reading now is a revisionist history. Enrile replied that history is made up by people who want to portray what they want to portray. "Who brought the democratization of education in this country? Noynoy Aquino? Cory Aquino? Who brought the irrigation canals all over the country? Who brought the rural electrification in this country? Have they written about these things?" he said. "Who destroyed the nuclear plant? and who initiated it in order to stabilize the power system of the country?" added. He said that he is not revising history, but wants answers to his questions. Valdez said that Enrile's 51 years in politics, and having witnessed eight presidencies, she is not one to debate him. "I am not saying that I know everything, but when i deal with the problem, i go into it and learn it in order to understand the situation."